What is Atlantis Word Processor? 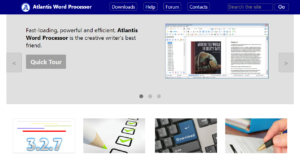 Atlantis Word Processor is a lightweight document creation software that comes with all the features typical to many word processor solutions and a number of unique features that are very popular to all sorts of writers such as publishers, journalists, storytellers, novelists, and short story writers to mention a few. Fast, powerful, and efficient, users can take Atlantis Word Processor wherever they go, enabling them to write down their thoughts, ideas, even whole chapters whenever their creative juices start flowing. Perfect for writers on the go and whose work involves creating documents on a daily basis. Aside from crafting e-books from scratch, Atlantis Word Processor can transform any document into an e-book in mere minutes and a few clicks. Atlantis Word Processor has all the tools, the look, and the feel of popular and traditional word processing software systems in the market. This means you won’t have to spend a significant amount of time learning and getting familiar with the platform. Once it is ready to go, you are too. The interface and the tools are so recognizable that you will almost immediately feel at ease with the software and write articles, essays, and stories with incredible ease. While Atlantis Word Processor may feel familiar and similar with most word processing solutions today, it does have a number of features that are uniquely its own and not offered by other systems. For instance, it can detect if you are using a particular word or phrase far too often than you should. Atlantis Word Processor can detect and instantly spell out commonly used words to increase your typing pace. It also has a native feature that saves your documents as PDF files, which is something many writers find appealing. Most word processing software systems need to be installed to a computer or laptop before you can use them and this is where Atlantis Word Processor trumps many of the competition. You can put your Atlantis Word Processor into a USB device, stick it to any computer or laptop, and start writing. No more mandatory installation. Just plug and play. What Problems Will Atlantis Word Processor Solve? Many authors have difficulties with creating error-free eBooks that pass through the EPUB validation test. eBooks that don’t pass the validation test are normally rejected by a number of popular publishers. Atlantis Word Processor automatically generates code-error-free eBooks that pass the ePub validation test. The system requirements of Atlantis Word Processor are very modest. It doesn’t require the latest Windows version, Internet connection, or certain amounts or RAM or disk space. It can be run on any desktop or laptop equipped with Windows 10, 8, 7, and Vista. It can be also used under Windows XP and even Windows 2000. So businesses don’t need to upgrade their hardware or operating systems in order to use Atlantis Word Processor. If you are interested in Atlantis Word Processor it might also be beneficial to analyze other subcategories of Best Document Creation Software collected in our base of SaaS software reviews. There are well-liked and widely used solutions in each software category. But are they essentially the best fit for your enterprise’s special wants? A popular software solution may have thousands of subscribers, but does it present what you require? For this reason, do not blindly invest in popular systems. Read at least a few Atlantis Word Processor reviews and consider the aspects that you wish to have in the software such as the cost, main features, available integrations etc. Then, select a few systems that fit your wants. Try out the free trials of these products, read online comments, get information from the vendor, and do your homework systematically. This profound groundwork is sure to aid you select the best software solution for your firm’s specific needs. How Much Does Atlantis Word Processor Cost? Contact Atlantis Word Processor for information on its basic and enterprise pricing packages. A free download is also available. We realize that when you make a decision to buy Document Creation Software it’s important not only to see how experts evaluate it in their reviews, but also to find out if the real people and companies that buy it are actually satisfied with the product. That’s why we’ve created our behavior-based Customer Satisfaction Algorithm™ that gathers customer reviews, comments and Atlantis Word Processor reviews across a wide range of social media sites. The data is then presented in an easy to digest form showing how many people had positive and negative experience with Atlantis Word Processor. With that information at hand you should be equipped to make an informed buying decision that you won’t regret. What are Atlantis Word Processor pricing details? What integrations are available for Atlantis Word Processor?